Ceramics, and Nandini Datta, who works with Glass, are coming together to display their ceramic and glassware works as part of a group exhibition titled ‘Earth, Sand & Fire: The Consequences’ opening on January 18, 2019 at 7 pm at Carpe Diem Art Gallery, Majorda. The exhibition will be on display until February 5 from 10 am to 7 pm (Mondays closed). "As an interdisciplinary artist, I create my style through the integration of the strongest of my skills – namely print-making, murals and hand-built pottery. Through the medium of ceramics I express my views on various subjects close to me. "As part of this exhibition I have chosen to work on a theme related to the architectural and ecological heritage of my home state of Goa. As a continuation to my recent series of ceramic works on Goan architecture and colonial influences, this body of work further explores familiar facades seen all over Goa and also tries to capture the local aquatic life found in our sea, rivers and water bodies – something we have always depended on as a source of food and for maintaining the delicate balance of our complex ecology," says Ramdas Gadekar. A graduate of the Goa College of Art, Ramdas is a teaching artist who is very versatile with his hands. He has participated in many painting and print making camps and has exhibited his artworks in group shows across India. Ramdas describes ceramic as very meditative and relaxing. The entire procedure of baking ceramic contains suspense as it often gives results that are surprising. 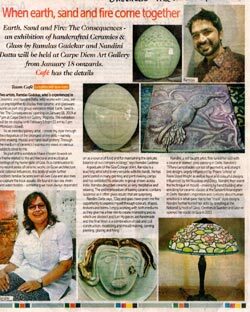 Nandini Datta says, "Clay and glass have given me the opportunity to express myself through colours, shapes, textures and forms. I enjoy working with both mediums as they give me a free rein to create interesting pieces which are abstract and fun! My pieces are handmade and the final finish is a combination of slab and coil construction, modelling and mould making, carving, painting, glazing and firing." Nandini, a self taught artist, fine tuned her skill with a course in stained glass painting in Delhi. Nandini's 'Tiffany Lampshades' consist of geometric and straight line designs largely influenced by 'Prairie School' of Frank Lloyd Wright as well as floral and colourful designs influenced by Art Nouveau and Deco. Nandini then learnt the technique of mould – making by hand building after enrolling for ceramic classes at the Sanskriti Anandgram in Delhi. Nandini’s inspiration and curiosity about human emotions is what gave rise to her “mask” style designs. Nandini further honed her skills by enrolling at the National School of Glass, Orrefors in Sweden and later re opened her studio in Goa in 2013.